Summary: The Administration has launched a new competition for virtual and augmented reality developers to create learning tools to support career and technical education. President Obama, March 2011, speaking about the need for innovation in education. Imagine learning about biology by traveling inside human cells, or chemistry by experimenting with all of the elements of the periodic table, or computer science by programing robots to explore other planets. Virtual reality and augmented reality are new and emergent technologies that have received wide media coverage in the past year with the potential to make all of these experiences come to life. As evidenced by the Virtual Reality Developers Conference that was held this month in San Francisco, there is a growing developer community that is experimenting with these technologies and hungry to create experiences that are not only immersive and engaging, but can also transform the way stories are told and the way people learn. To harness the creativity and ingenuity of this developer community on behalf of America’s students, the U.S. Department of Education has launched the EdSim Challenge for next-generation educational simulations that will prepare students for the globally competitive workforce of the 21st century. The Department is calling on the virtual reality, video game developer, and educational technology communities to submit concepts for immersive-learning experiences that strengthen career and technical skills. The Challenge will award $680,000 in cash prizes and additional sponsor prizes from IBM, Microsoft, and Samsung. This is a bet worth making. Students learn best when they are deeply engaged and excited, which is why President Obama has called for more educational tools that can push learning while entertaining and motivating children. Simulation-based learning can provide students with enriched experiences in information retention, engagement, skills acquisition, and learning outcomes. 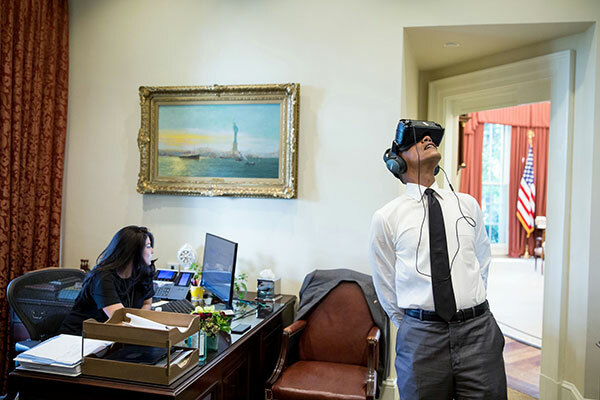 It’s why in 2014, the Administration held the first White House Education Game Jam to demonstrate that engaging developers and designers of high-quality games and having them work with teachers and students could lead to powerful new learning experiences, and in 2015 the U.S. Department of Education built on this idea by holding the first Games for Learning Summit with Games for Change. Even with the strong progress this Administration has made to improve STEM education, there is more to be done. As the jobs of tomorrow require students to hone increasingly diverse skill sets, further investments in these new learning technologies will be essential for preparing students for success in future careers and life, a core goal of the President’s Educate to Innovate initiative. That’s why the U.S. Department of Education is most interested in simulations that pair the engagement of commercial games with rigorous educational content to transfer critical academic, technical, and employability skills. The EdSim challenge is the latest example of this Administration’s use of incentive prizes and challenges to harness the ingenuity of the American people. Since 2010, more than 100 Federal agencies have engaged 250,000 Americans through more than 700 challenges to address tough problems ranging from fighting Ebola, to decreasing the cost of solar energy, to blocking illegal robocalls. Those interested in entering the Challenge should submit their simulation concept proposals by January 17, 2017. Following the close of the submission period, a multidisciplinary panel of judges will evaluate the entries and select up to five finalists to advance to the Virtual Accelerator phase. Each finalist will be awarded $50,000 and gain access to expert mentorship as they refine their concept and build a simulation prototype. Stay tuned and visit the EdSim Challenge website to learn how you can reimagine the future of learning. Erik Martin is a Policy Advisor for the White House Office of Science and Technology Policy. Albert Palacios is an Education Program Specialist at the U.S. Department of Education. All references to specific brands and/or companies are used only for illustrative purposes and do not imply endorsement by the U.S. federal government or any federal government agency. For more on challenges and prize competitions, read our latest Challenges articles. Thinking about running a challenge and prize competition at your agency? Connect with over 700 government professionals by joining the Challenges & Prizes Community. Read our recent articles on virtual and augmented reality and the new AI and Virtual/Augmented Reality Communities—join both via our main Communities page. This post was originally published on the Office of Science and Technology Policy (OSTP) blog.